This is another multi-week recap. The week before last I was out of town for a good chunk of the week and ate things I normally wouldn’t and couldn’t quite exercise the way I like to, but I attempted to make the best of it. I did not take a picture of the scale last week as I felt it wasn’t exactly accurate because I had eaten so much restaurant food that I knew a lot of what the scale said I had gained was just water weight from the excess sodium I had consumed from the restaurant food, so I’m skipping that weigh in. Here’s last Saturday’s weigh in. While I’m not back to where I was before the little trip out of town, I am very happy I am NOT where I was the week before last. You don’t know because I didn’t take a picture of it and I’m not sharing. 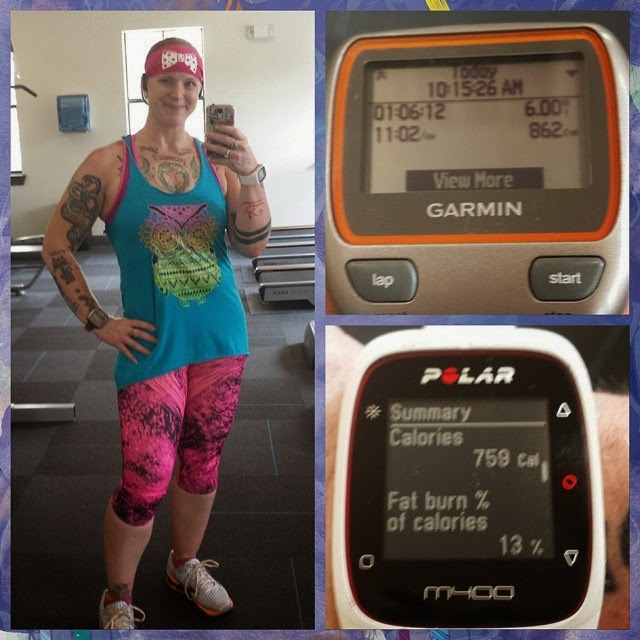 It was an out of the ordinary week for me and I figured that a good deal of what I gained per the scale the week before was water weight and therefore not an accurate weigh in. 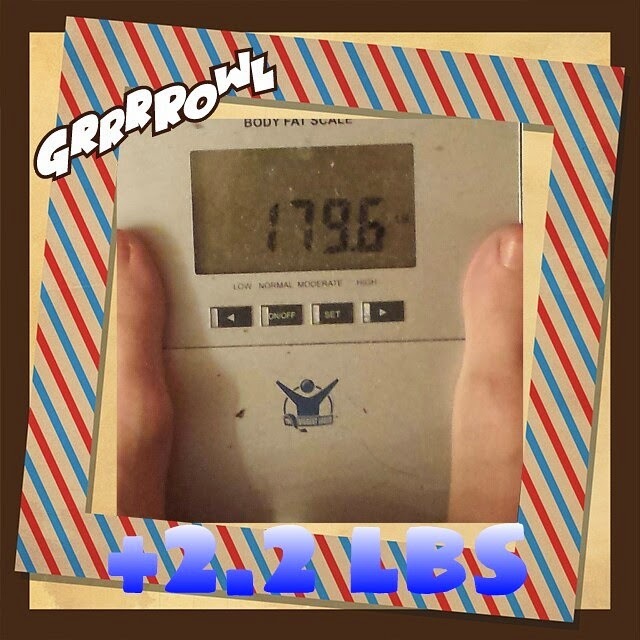 So, when I stepped on the scale last week and saw this, I was “okay” with it…not happy, but not really upset either. Now let’s move on to my exercise for the last couple weeks. 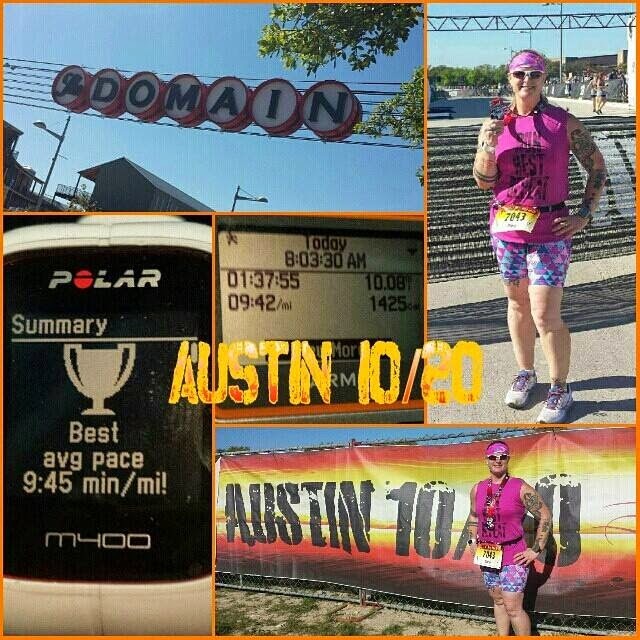 • Saturday: rest day, running the Austin 10/20 the next day. 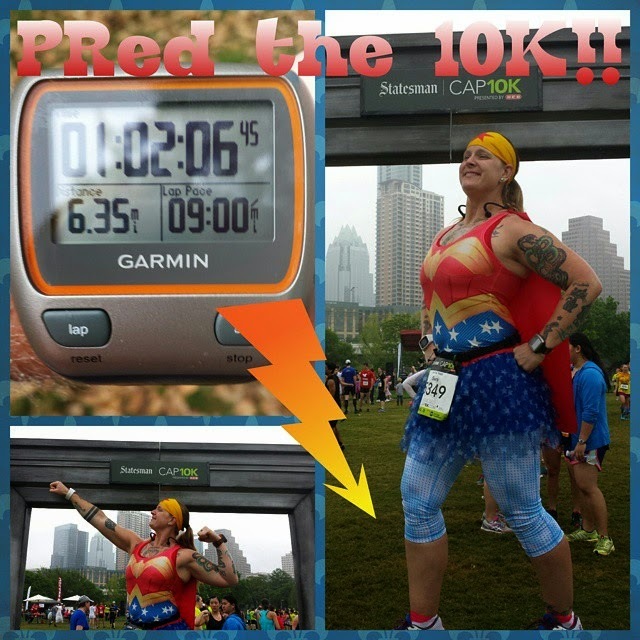 • Sunday: ran the Austin 10/20 and totally rocked it! Last year I ran this race in 1:54:56. Right before the start, I told my friend Rob that I was hoping for a PR but inside I figured it wouldn’t be more than a 5 minute PR. I instead, got a 17:16 minute PR!!! Holy cannoli!! I will post a full race report on Monday now that I have my official race photos! • Monday: no exercise, packing for my out of town conference, driving to conference and then eating out (and eating WAY too much food) with the other ladies from my work that also went to the conference. • Tuesday: met up with my friend Jennifer that lives in the city where the conference was and walked 6 miles together. 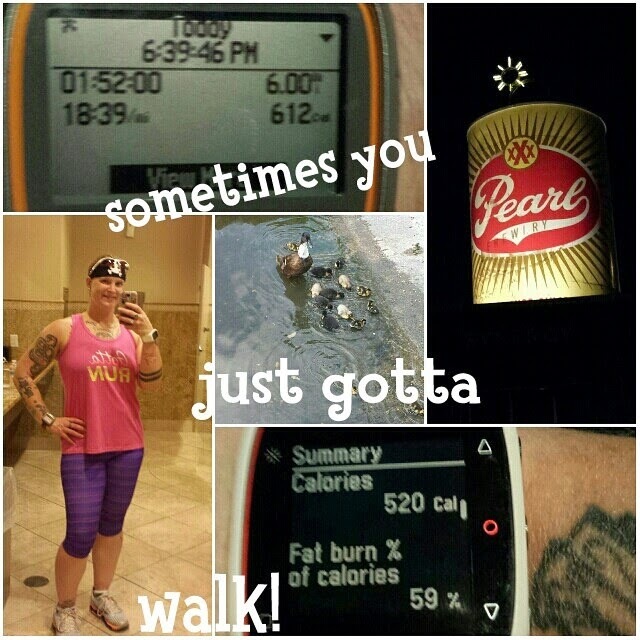 • Wednesday: since I had originally planned to run Tuesday and didn’t get to do that, I headed out on my own for the same route that Jennifer and I had walked the previous night and ran it. Ran it without music and about half a mile into it, I regretted that decision. And, since this day was April Fools, I tried to play a joke on my Facebook followers saying that I had decided to give up running and become strictly a walker. No one bought it, though. • Thursday: no exercise. I had planned to hit the gym, but got distracted with house work, so that didn’t happen. • Friday: no exercise again. Was thinking maybe I’d go for a run, but decided to save my legs for the next morning’s 5K. Just did some cooking and more house work instead. Also went to a screening of The Last Unicorn (my favorite movie in the whole wide world). 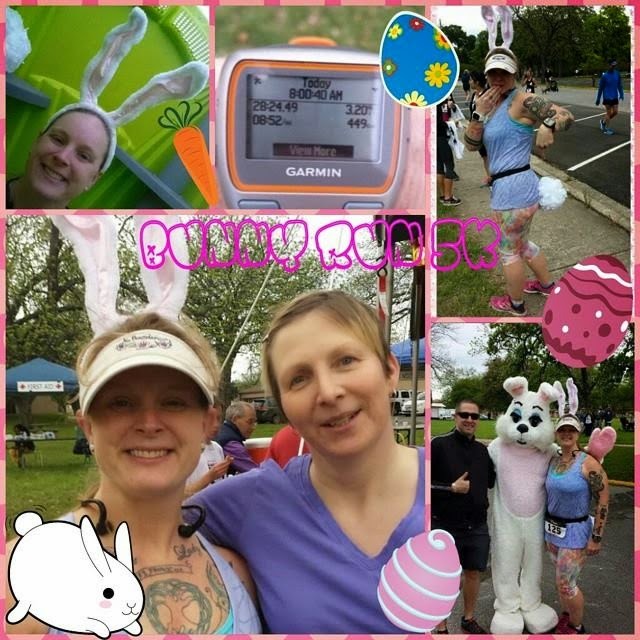 • Saturday: ran the ASH Dash Bunny Run 5K. Great race! PRed big time but didn’t get top 3 in my age group. See my race report(post link to bunny run race report) if you’re interested in the particulars. • Monday: I had planned on a 4 mile run since I ran hard on Saturday and then ran long on Sunday. I woke up over an hour before my alarm and just couldn’t go back to sleep, so I got up, started some coffee and turned on Kelly & Michael Live (my favorite morning talk show…they’re hilarious). They were broadcasting live from the White House for the annual Easter Egg Roll they do on the White House grounds. They, of course, interviewed the First Lady and she was talking about how it’s the 5th anniversary of her Let’s Move program so they had started a “gimme 5 challenge.” (I spell it “gimmie” but they spell it “gimme”) Basically, you just do 5 of some physical activity and then challenge a friend, family member or co-worker to do the same. There’s no do 5 or else like with the ice bucket challenge. Just do 5 of something and feel good about yourself for doing it. Well, I figured I could just tack on another mile to my run today and do 5 miles and then challenge someone else to do 5 of something. So that’s what I did. • Tuesday: oy, 4th day in a row of running…for a little “mini-streak.” However, 4 days is the most you will ever see me run in a row. Why? Please see my blog I posted about Why I Don’t Streak <<<<<<<<<<<<<link>>>>>>>>>>>>>>. I ran 8 miles and it started off okay and continued to be “just okay.” I had one goal for this run: keep it below 11:30 per mile. I succeeded. My slowest mile was 11:14 and my fastest mile was 10:55. Between the last 4 days of running, I ran 26.2 miles. Nice. The only reason I ran 4 days in a row is #1, I had the Bunny Run on Saturday and I don’t normally run on Saturdays. 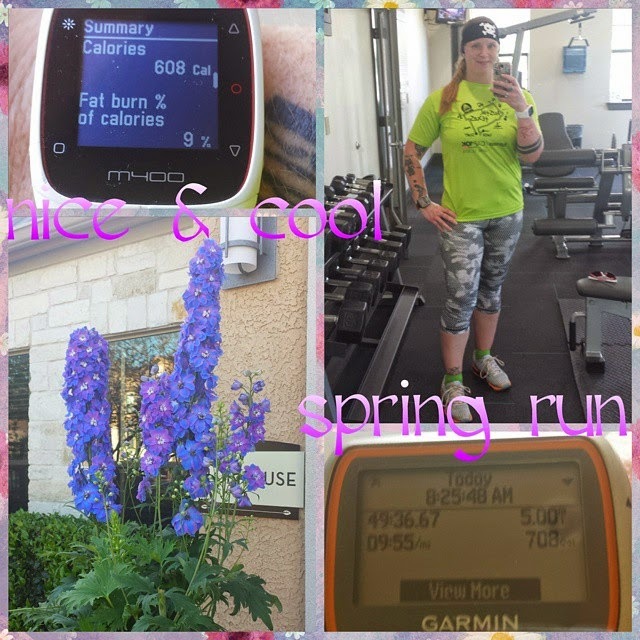 #2, I had my usual long run on Sunday and a follow up shorter median run on Monday. This is all normal for me. I ran again on this day (Tuesday) because I didn’t have any overtime lined up for this week so I wanted to make sure I still got my 4 runs in this week and also left myself open for working overtime at the last minute. This way, I’ve gotten 3 of my 4 runs out of the way in the first part of the week and then I have Thursday or Friday to do my 4th run. I would do it Wednesday, but no. I’m not running 5 days in a row. 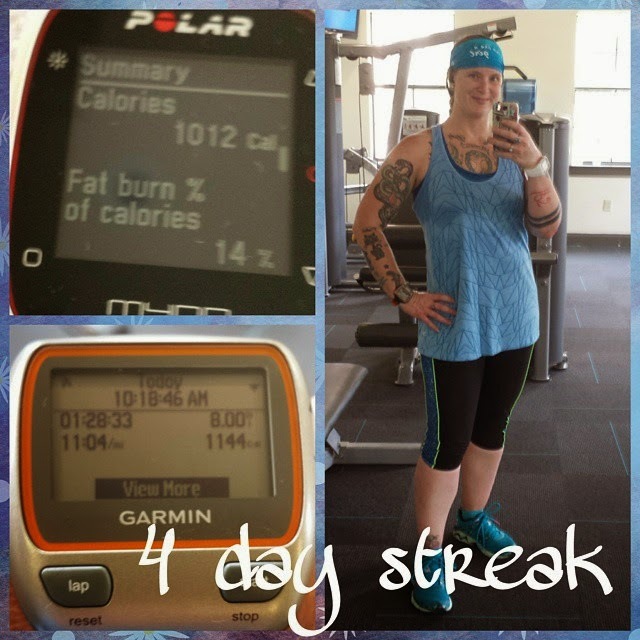 • Wednesday: …and on the 5th day, she went to the gym… Haha, no 5th day in a row of running for me! It was nice to get back in the gym. It’s been at least since the week before last since I’ve been to the gym, so 2-ish weeks. Ugh. 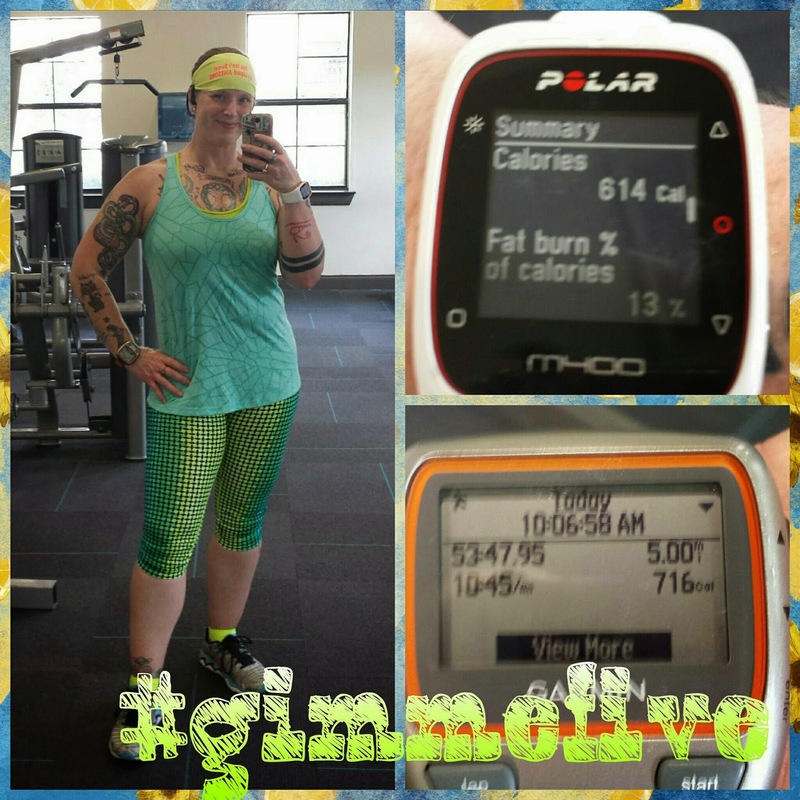 I hate that my trips to the gym always seem to get sidelined…but, running is my #1 love and #1 priority. But, that said, BECAUSE running is my #1 everything, that is EXACTLY why I need to not sideline my gym visits. Regular strength training decreases instances of injury in runners…it’s a proven fact that I have read in so many different sources. And I really do enjoy the gym. Back in the day, weight lifting was my #1. 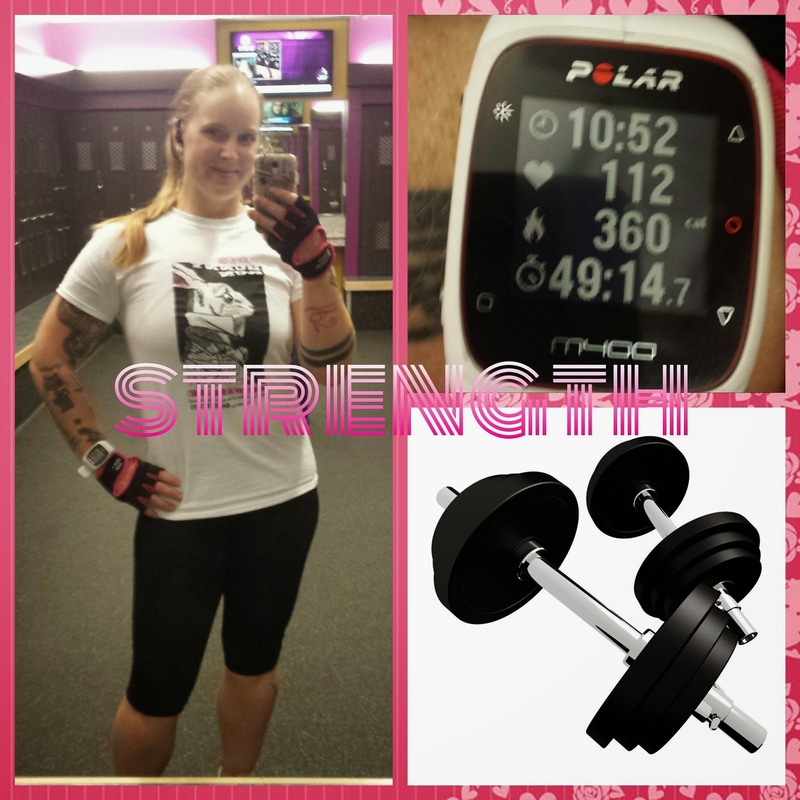 I am a former powerlifter AND bodybuilder. Got you all intrigued, now, eh? Basically, I know my way around a gym and I’ve never met a lift I didn’t like. Haha. Anyway, at the end of my workout, there was a lady at the smith machine doing static lunges and it got me to thinking. So, I am going to add some smith machine squats and walking lunges to my gym workout. • Thursday: ran 6 miles this day. It is now obvious that even though it is only the first half of April, it is already summer in Texas. Ugh. I am getting so fatigued running mid-morning. I’m going to have to start getting up no later than 7:30am and be out my front door to run no later than 8am. I have a sneaky suspicion that this summer is going to be straight up ridiculous when it comes to heat and humidity. So, I’m looking at starting my 5am wake ups for running probably shortly after my return from Oregon vacation in the latter half of May. Great. And I’ll be doing those early rises through September if I remember how last year’s marathon training went properly. But, that’s okay. I really do actually like running before the sun comes up. It’s so peaceful. • Friday: REST DAY!!!!!! I didn’t do squat this day. After doing some form of exercise for the previous 6 days (5 running and 1 gym), I’m tuckered out! So, I took this day and today (Saturday) as rest days before I attempt to run as fast as possible tomorrow. Tomorrow, I’m running the Statesman Capital 10K for the 3rd year in a row. I’m seriously hoping to PR the 10K distance. I’d like to do it in an hour flat or less. My current PR for the 10K is 1:02:48. My PR on this particular course is 1:06:53. This course is much hillier than the course I have my 10K distance PR on, so, really, I will be happy with 1:05:00 or faster, but I’m still going to shoot for an hour flat or faster. Gotta try, right? Ooooookaaaaaaaaay…so, I forgot to post what I had up to this point last Saturday (again), so now it’s a 3-week recap. Oy. I'm not posting the scale this week. I have had a very off week and have had a lot of anxiety this week so I have been turning to foods I shouldn't be eating. I'm hoping to get it back under control next week and not completely fail out of the "no junk" challenge I have been attempting to participate in. 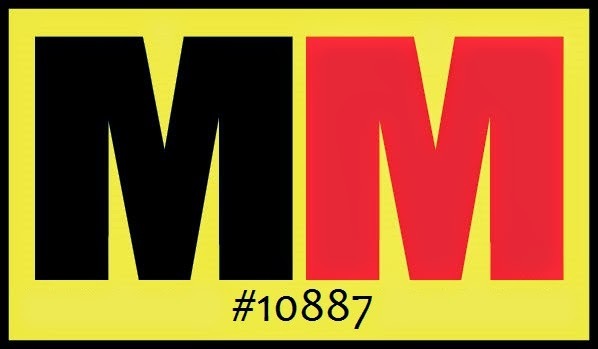 • Saturday: as previous noted, I had no plans to exercise this day but to rest for a second day in hopes of securing a PR or a sub-1 hour finish at the next day’s 10K race. • Sunday: day of the Capital 10K race!!! WOOHOO! I am very happy to report that I achieved my goal of a PR, but not my goal of finishing in under an hour. As soon as I get official photos, I'll be posting a race report. 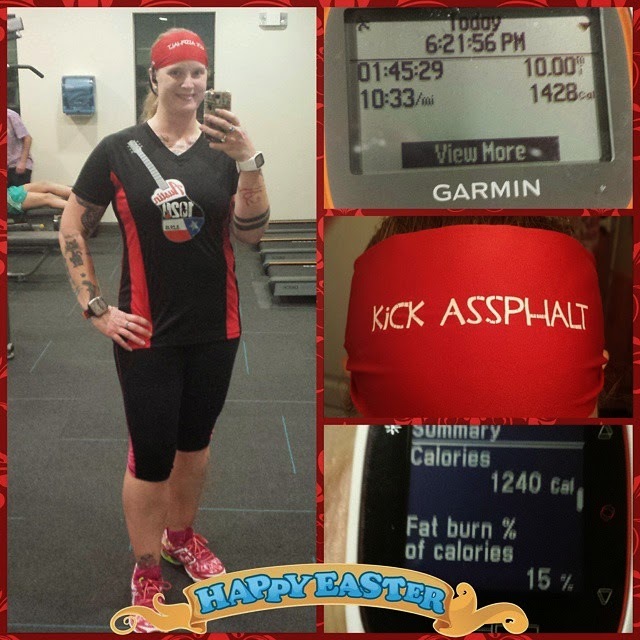 • Monday: when I looked at the running schedule I had done, I had 12 miles scheduled for this day. I did not feel like running 12 blah miles. So I came up with a better idea! 8 hilly miles! 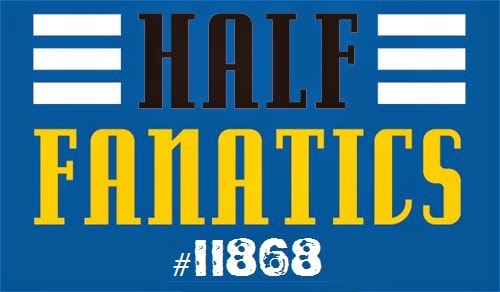 It was a great run! A great challenge as I decided I wanted to keep all my miles under 11 minutes after the first few miles were under 11. I think I want to try to do this run either every week or, at the very least, every other week. A great workout! • Tuesday: hit the gym! YAY! I added the smith machine squats to the end of my workout like I was talking about doing, and it was pretty good. 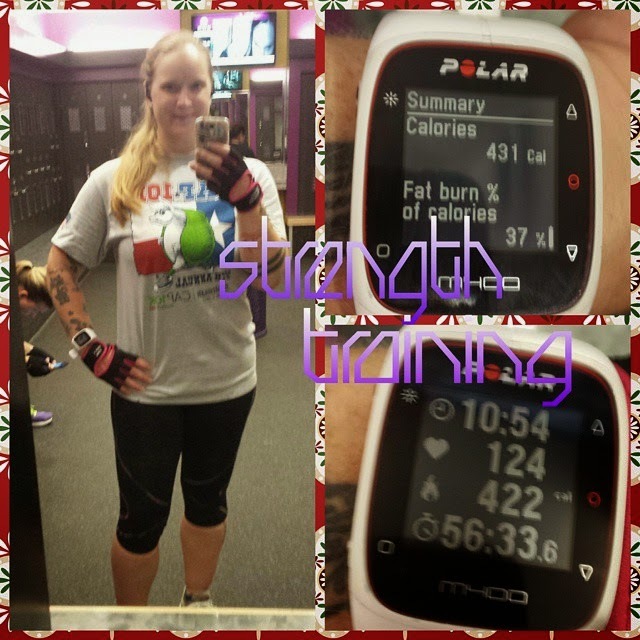 I didn’t add the lunges yet because I wanted to see how I would feel after the squats first. Next week I’ll add the lunges. But I don’t think I’m going to do walking lunges. I think I’ll do static lunges with the smith machine. I’ll do a set of squats and then a set of lunges on each leg, then repeat the whole thing. And when I do my squats, I place my feet further in front of me so that I keep my back straight as I squat and so it hits my glutes more. • Wednesday: got up early and it was a nice, spring-ish 54° outside. Perfect. And my body was all about running too! 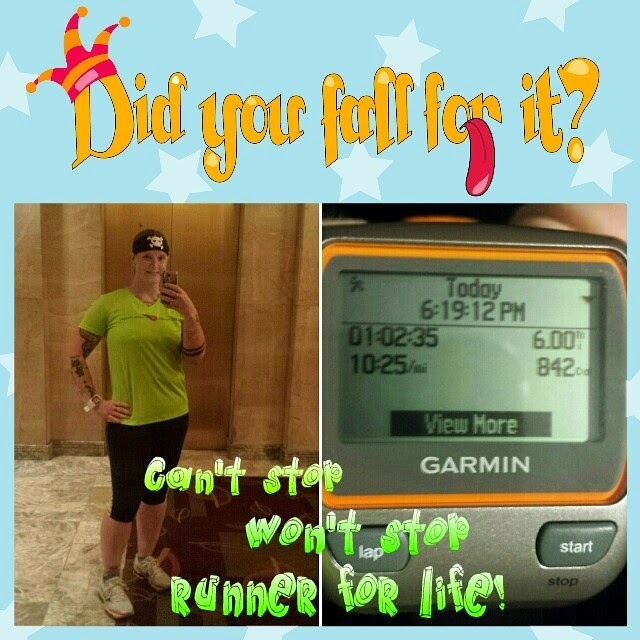 I ran the 5 miles with an overall average of 9:55 min/mi. YAY! • Thursday: worked a double shift on Wednesday and this day, so no workout. • Friday: worked a double Thursday night, so no time to exercise this day. 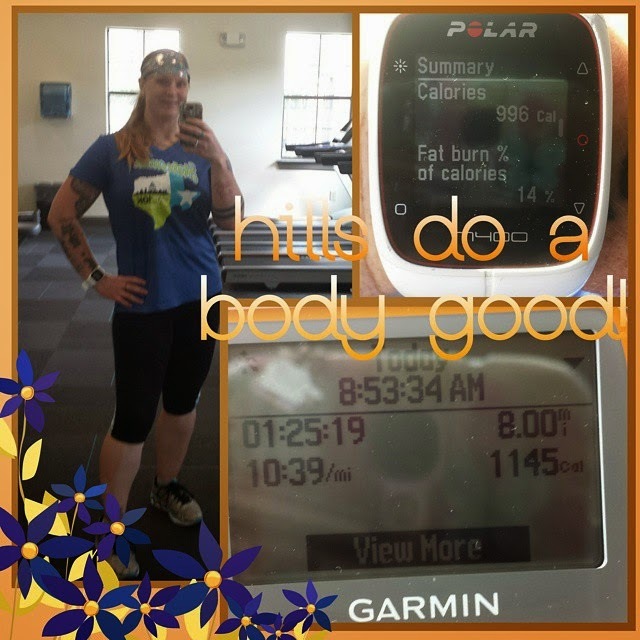 Even if I did have time, it would have been a rest day in prep for today’s 5K new PR attempt!